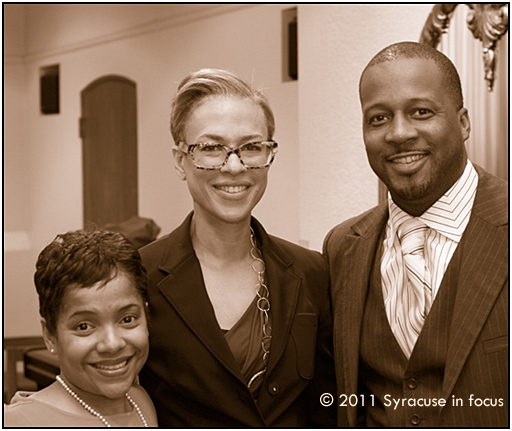 Salina B. Lazarus, Tonya Lewis Lee and Pastor Daren Jaime at Syracuse UniversityProducer, attorney and author Tonya Lewis Lee says she was surprised to learn several years ago that infant mortality rates among African American women were twice that of whites and Latinos here in the United States. She also found out that even among educated African American women, and those with access to healthcare, the infant mortality rates were disproportionately high. “Clearly this is not a poverty issue,” she says. Lewis Lee, the national spokesperson for the Healthy Baby Begins with You Campaign, was in town today at Syracuse University to present the 36-minute documentary she produced titled: Crisis in the Crib: Saving Our Nation’s Babies. Despite the alarming statistics, Lewis Lee says she is optimistic that with increased education, further advances in genetics, as well as a collective effort from government, the medical community and the private sector working together, things can improve. “There’s no overnight fix,” she says. Lewis Lee talked earlier this year to NIFTN’s George Kilpatrick about her book Giant Steps to the Change the World. She said her next project will be to co-produce a film adaptation of the Christopher Paul Curtis book The Watsons Go to Birmingham 1963 along with actor, comedian Chris Rock.